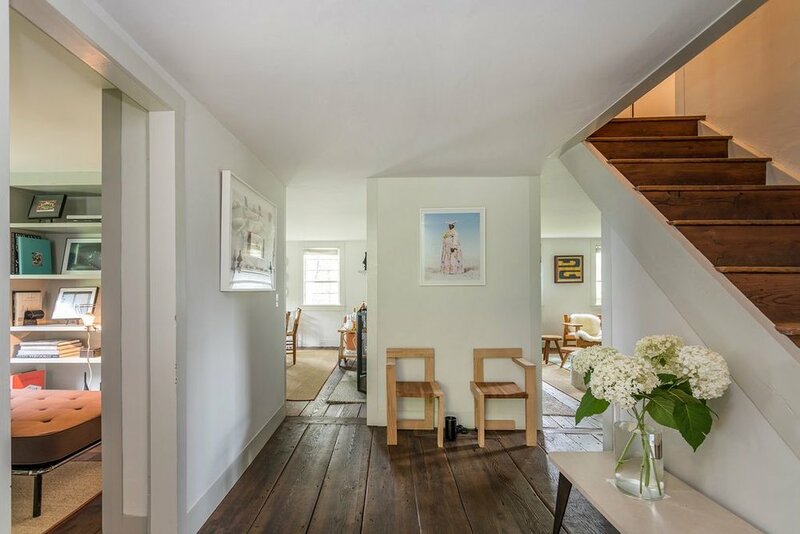 This simple little saltbox house caught my attention as I was browsing real estate listings in Litchfield Co., Connecticut. It struck me as very Little House on the Prairie, the way it sits in the grass tucked beneath that enormous tree with the perfectly sculpted stone wall extending into its side yard. The gray clapboards, the stout central chimney, the shutter-free windows: it’s a quietly stunning example of American colonial architecture. 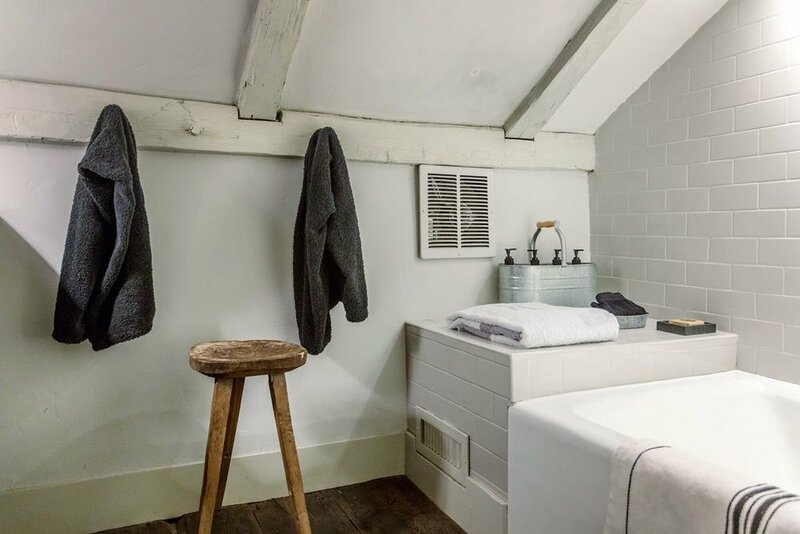 As I tend to do, I scrolled through the listing photos before reading the description, eager to see if the interior rooms and remaining property were just as appealing as this single perspective. I’ve been fooled before by cute, historic-looking exteriors that have been nothing more than cruel, hoax-ridden façades hiding dated renovations from the 80s, bathrooms clad in 50s-style tile, and junky DIY jobs. This particular exterior was extremely misleading—but in the best way possible. 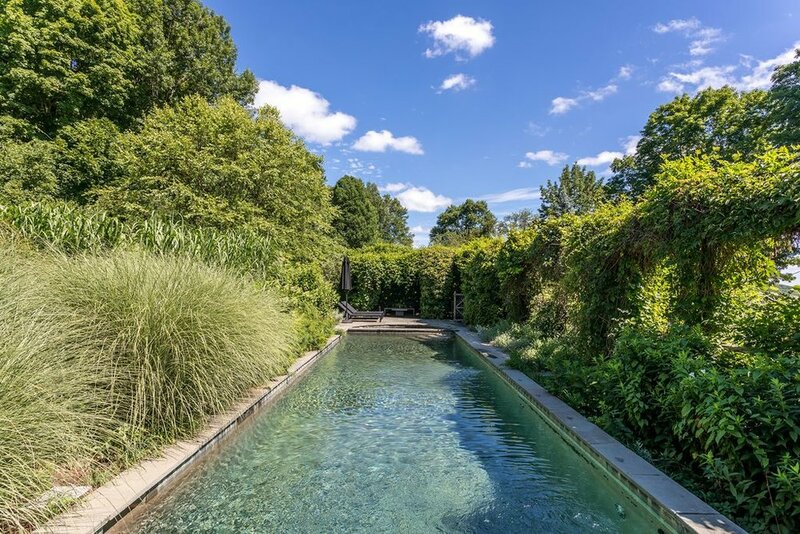 Exhibit A: this photo of the pool (which is really just a teaser for what’s to come) tossed into the first three listing photos, no doubt to make viewers gasp and halt their scrolling to fully ogle the scene. I can practically feel the warm breeze playing off the surface of the water and smell the sweet scent of the lush landscape enveloping this secluded escape. Under a sky that blue, the temptation to stay poolside all day is real, and I almost lost the urge to continue exploring the rest of the photos because I was absolutely mesmerized by the perfection of it all. Moving on to the interior, another unexpected twist awaited my discovery: the walls and wooden beams have been washed in cool tones of white and gray. 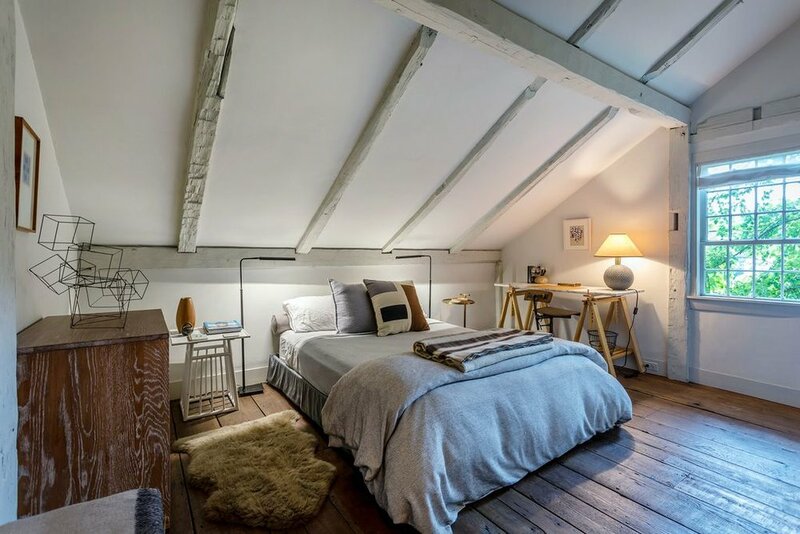 At first glance, it reads contemporary, but a closer look reveals the rustic nature of the original architecture has been preserved, from the exposed beams to the rough-hewn floors. The mix of midcentury and modern furniture with the subdued color palette and varied textures of the furnishings feels inspired by Scandinavian design, topped off with an obvious touch of hygge. It is both updated and ready to cater to the needs of modern-day living while also being completely in touch with its quaint, cozy roots. 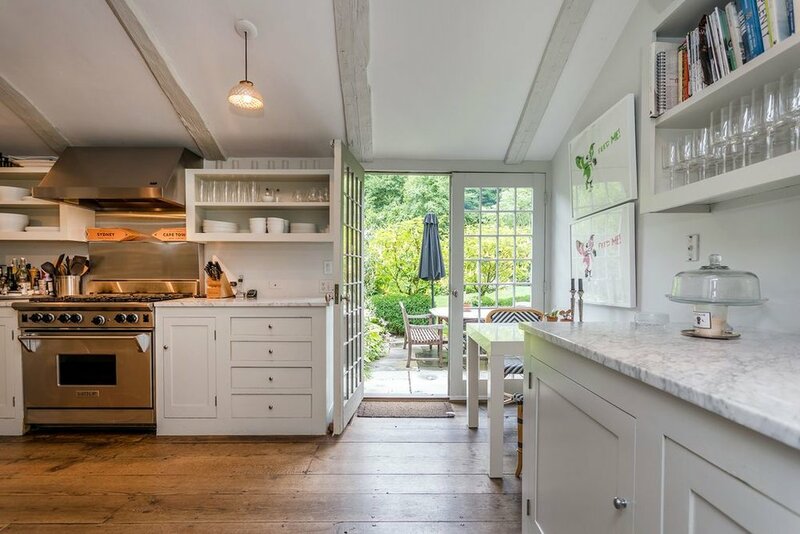 The kitchen fully embraces the house’s rustic bones and cottage vibes, particularly through design details such as the open shelving, Shaker style cabinetry, and wide plank floors. However, the stainless steel appliances don’t seem out of place here. A set of French doors opens onto the patio and outdoor seating area. Where color is used, it is used sparingly yet playfully. Artwork in the kitchen and dining room punctuate the mostly white and neutral rooms. The play between traditional and modern design elements continues throughout the rest of the house. The front hall expertly displays the juxtaposition of the smooth white walls against the grain-heavy floors. Thanks to their abundant texture, the floors prevent the house from appearing cold and out of touch with its 19th century provenance. The bedrooms share the neutral aesthetic of the public rooms on the first floor. The exposed beams and hardwood floors create a nest-like backdrop for the streamlined furniture. Outdoors, the property is connected by a series of gardens and intimate seating areas. Whether you fancy an outdoor breakfast, lunch with friends on the patio, a relaxing break by the gardens or pool, or an evening in front of the outdoor fire pit, the options for lounging while surrounded by nature are endless. The dining table on the patio overlooks a grassy patch of lawn which connects to the pool behind the ample hedge. 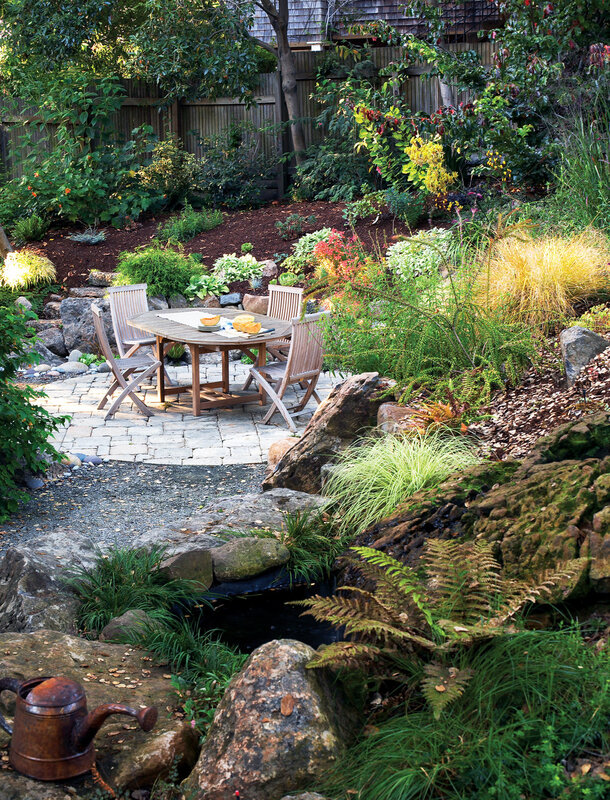 A firepit centered in this tidy gravel circle fills out an outter nook in the grass. A natural wooden pergola shields this seating area from the sun, providing a relaxing space to enjoy the outdoors even on the hottest of days. 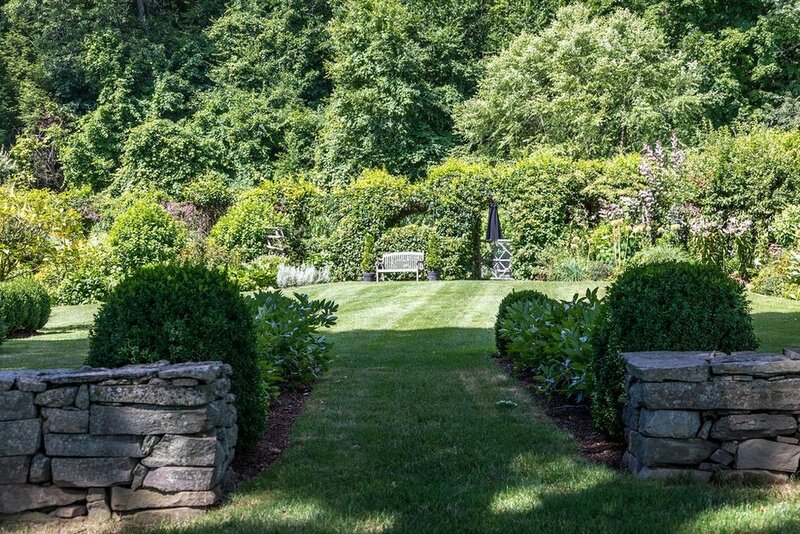 The carefully planted yet carefree gardens add depth and whimsy to the landscape. Eventually, I did read the listing description, and in doing so I gleaned that this house has apparently caught the attention of more than one well-known house and garden publication. 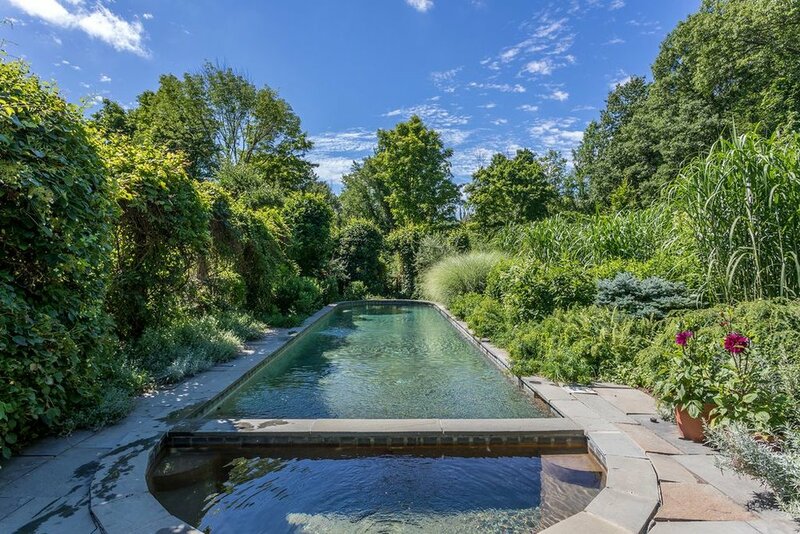 It’s not hard to see why Gardenista decided to share this property several years ago in a feature on secret gardens. A parting view shows the Litchfield Hills in the distance. It’s rare to find antique and current styles so beautifully intertwined. The modern updates in this home have been tastefully executed to maintain the original charm. The results are surprising and altogether way too tempting! 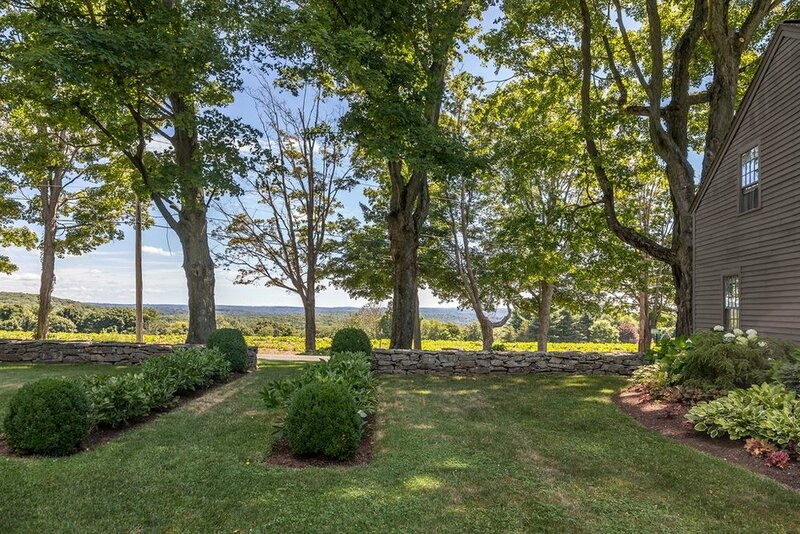 To see additional photos of this special country house in Roxbury, CT, check out the listing here. All photos of the house and property are from the listing. I've always had a soft spot for urban gardens. I tend to think of them as secret gardens, small oases carved out of tight quarters, nestled behind iron gates or wooden fences, hidden mostly out of view of the casual passerby. 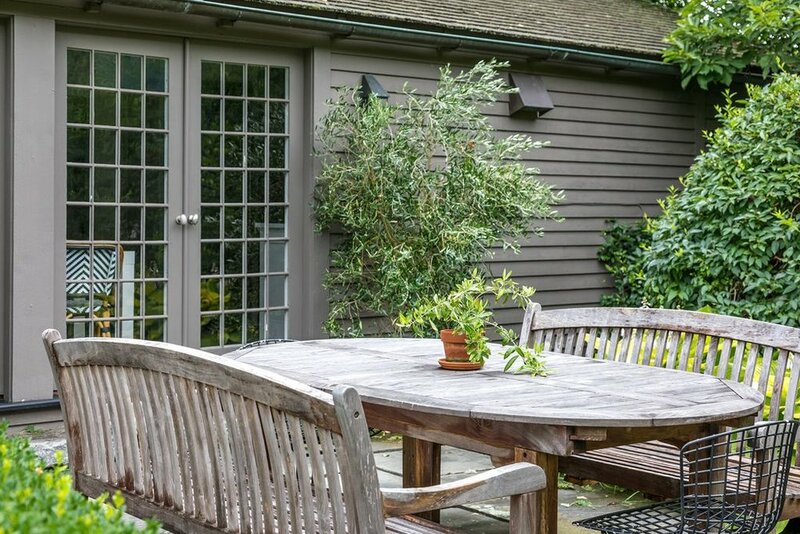 One of the best parts of walking around Beacon Hill or the South End is catching glimpses of these secluded outdoor spaces that have been transformed into verdant hideaways. The same can be said of Charleston or New Orleans—those cities know how to make small green spaces feel like they're worlds away from a bustling city. Aside from actually being in a city, urban gardens are defined by their size (usually small, or at least not sprawling), their privacy (typically enclosed by tall plants, hedges, walls, or fences), their abundant plantings (multiple containers or a mix of in-ground plantings and containers), and their focal point (or two). The concept is easy enough to recreate in a suburban setting, and it's an easy way to make a big impact on your yard's appearance with minimal upkeep. Rather than keeping up with lots of plants spread throughout the entire yard, you can concentrate your watering and pruning efforts on one dedicated area. Designate seating zones. 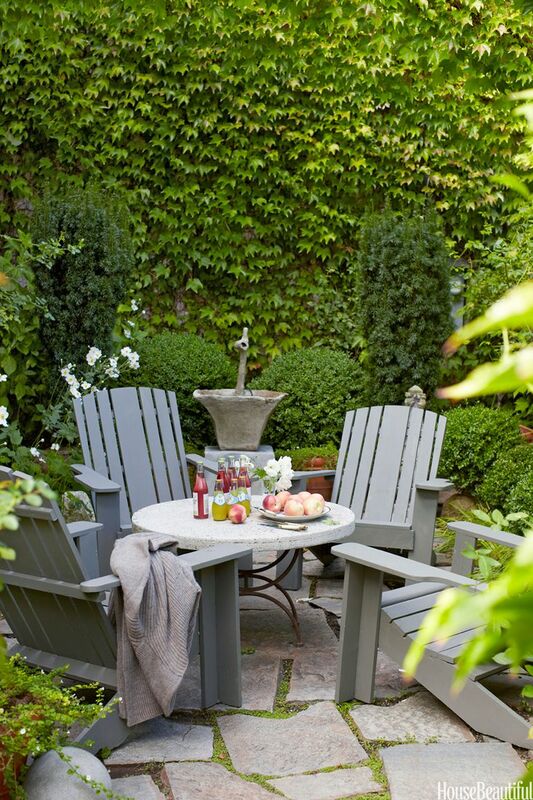 Identify places for seating, whether it's lounge furniture, a dining set, or a hammock. If you have room for multiple types of seating, leave a comfortable amount of breathing room between them. Benches can be placed along the outer edges of the area, creating extra seating that won't take up a lot of room in the middle of the space. Keep it neat. If one seating zone is all you have room for, don't try to cram everything together. Overcrowding the space will make it feel cluttered instead of cozy. Build a buffer. 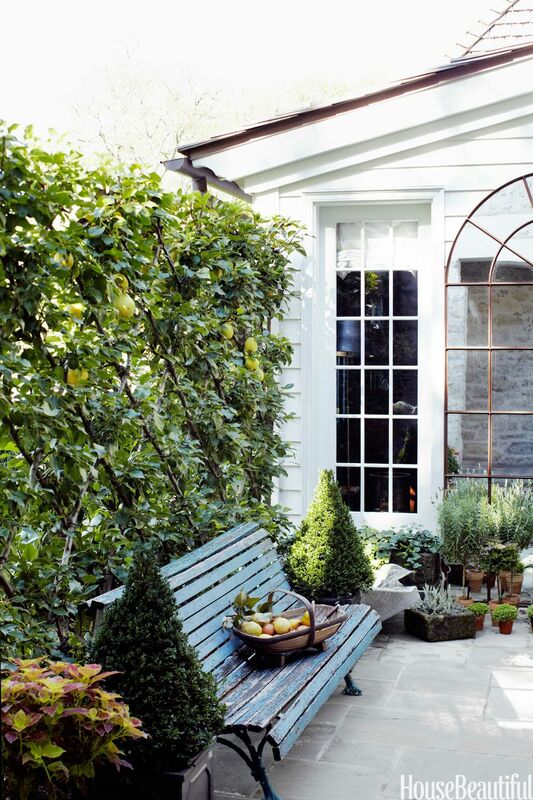 The idea is to create a privacy screen to make your space feel more intimate. The level of privacy you want will depend on how exposed the space is to the rest of your yard and neighbors. If you have two exterior walls that meet in a corner, your home's architecture can lend a hand in creating a natural buffer. 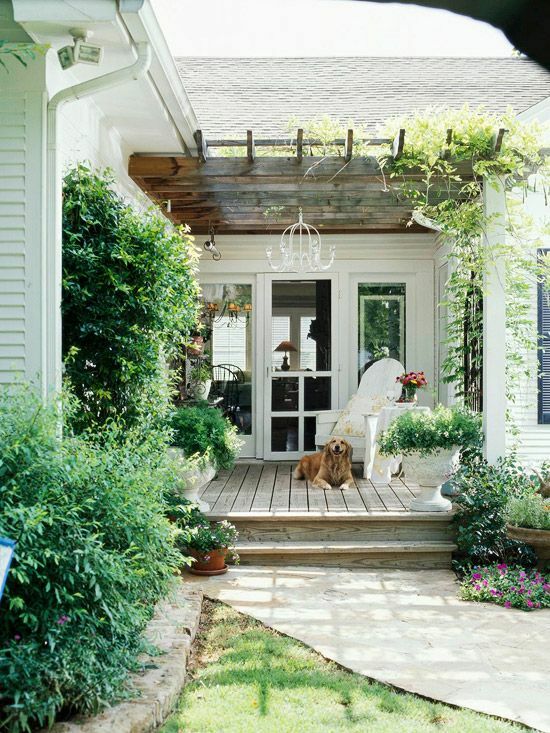 If your space is wide open, a pergola overhead or a series of trellises will enclose the space (and offer shade). Fences and hedges are good options if you want a low wall that doesn't necessarily offer complete privacy but sets the space apart from the rest of the yard. Cluster containers and plant border gardens. It might seem redundant to add more greenery to an area surrounded by grass or shrubs, but potting plants or adding a row of flowers along the edge of a deck or patio adds layers of color and texture, which makes the space appear leafy and lush. Treat potted plants and flowers as accent pieces, and tuck them in corners or along the borders of your space. Fruit trees and tomato plants can make great privacy screens because they grow taller than most flowers and herbs. Figure out a focal point. Depending on the amount of space you have to work with, this could be anything from a fire pit to a small fountain or a bird bath or bird feeder. You could also position your furniture to take advantage of a nice view. Don't forget to decorate. Stone statues, sundials, decorative bird houses, and wind chimes are fun finishing touches that your guests can discover as they look around your space. For a soft glow in the evening, hang string lights. Large lanterns that can be set up with battery-operated candles are a slightly easier, mess-free (and fire-free) option and still provide accent lighting after the sun goes down. 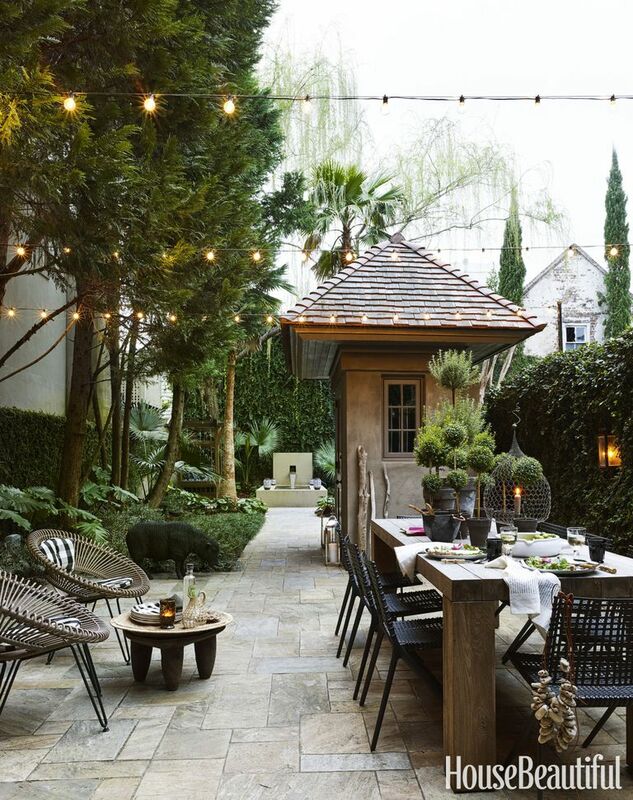 The key to successfully recreating an urban garden in your suburban space is choosing a small area of your yard to focus on and maximizing its seating potential and privacy while filling in the nooks and niches with lighting and decor. Use flowering plants in one or two hues to create a cohesive, calming atmosphere, or plant multicolored flowers to cultivate a lively, eclectic vibe. Start small to avoid overfilling the space (and overcommitting to lots of plant maintenance). It's easy to change things up from year to year with potted plants and decorative accents, so don't be afraid to try out new flower varieties and swap decor items until you find the right mix. 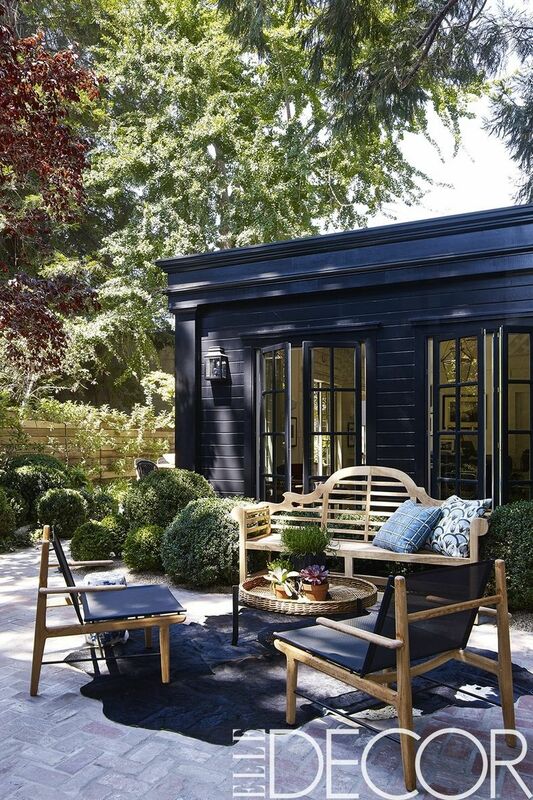 Think of your small suburban urban garden as an extension of your house and treat it like you would any other room—have it reflect your style, and always make it inviting.